Nobody wants to deal with bathroom mold. It’s unsightly, unhealthy, and just plain disgusting. Unfortunately, the ever-present humidity is a reality that makes moldy bathrooms normal but that certainly doesn’t mean you have to put up with black, slimy growth. In a bathroom, even in non-humid climates, mold can still grow simply because of the function and use of the space. Hot showers, shaving, and other grooming regimens require water, and, in many cases, hot water. That little fan whirling around won’t take out all the humidity and it certainly won’t rid the space of body oils and soap scum. It’s this combination which acts as food for mold to grow and spread, making it a difficult problem to combat. When you discover mold is slowly taking over your bathroom, it’s a good idea to take the opportunity to inspect every nook and cranny of the space. You might just find a small water stain in the back corner of the vanity, which of course, is a prime growth source for this repulsive fungus. If you find that it’s presence has taken over the base and rear of the vanity and/or has grown around the tub, it’s time to rid the space of those fixtures. Phone a junk removal service and have that stuff dismantled and hauled away. Change out the caulking. If the mold is running along the caulk lines of the tub and the vanity, there’s a great indication the caulk is no longer functioning to form a barrier. Strip away the old caulk and re-caulk those crevices. Give your bathroom a thorough cleaning. 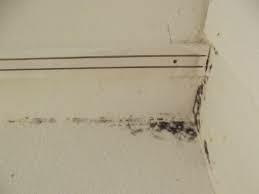 Mold, as stated above, grows where moisture, heat, sunlight, body oil, and soap scum are most prevalent. Use fungus killing household products to clean mold away, such as bleach, vinegar, and hydrogen peroxide. Be sure to keep the space well ventilated when using these products. Dry wet areas thoroughly. If there are places where water routinely stands, you’ll have to sop it up with a sponge and then dry it with a towel. To prevent mold from growing, wipe down the shower after every use, as well as the vanity. Try to keep the humidity level under 50 percent and also well vented to allow natural air drying.If you need help with junk, just phone 800-433-1094 or visit Junk Garbage Removal.